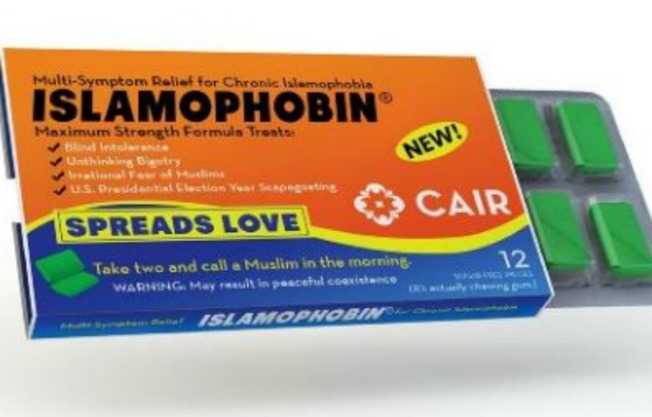 A medicine to treat Islamophobia has hit the market, as part of a novel satirical public awareness campaign that aims to "cure" haters against their ill-will toward Muslims. In an attempt to treat the growing Islamophobia in the United States, the Council of American-Islamic Relations, which has an office in Santa Clara, Califonia, is dispersing a mock-medicine called "ISLAMOPHOBIN." The fake drug claims to rid people of their irrational fear of Muslims, bigotry and blind intolerance, to name a few. "We hope humor will help create public awareness about the harm Islamophobia does not only to ordinary American Muslims, but also to the values of equality and religious freedom upon which our nation was founded," said Nihad Awad, CAIR National Executive Director. "ISLAMOPHOBIN is funny, but Islamophobia is not." Some side effects include "warm feelings toward Muslims, immigrants or refugees" to go along with acceptance, brotherhood and fondness, according to CAIR. CAIR has created a mock television commercial for its new product, which can be purchased on Amazon. The fake medicine is just sugar-free gum.